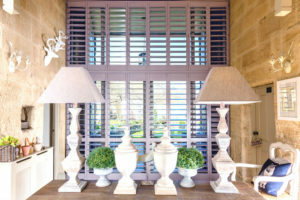 Plantation Shutters Cheshire West by Just Shutters – your number one choice for quality shutters. We stock the finest and most extensive range beautiful Plantation window shutters. As a result, we can offer the best quality shutters, industry leading service and great value guaranteed. Call your local shutter experts on 01244 567 890 for more information. WHY CHOOSE JUST SHUTTERS CHESHIRE WEST? Cheshire is famed for its beautiful sprawling homes and stylish interiors. However big or small, you can rely on us to provide bespoke plantation shutters that elevate the luxurious feel of your home. At Just Shutters we strive to ensure our service is always entirely bespoke and as such we offer the widest choice of finishes, materials and styles in the UK. Our local shutter experts are husband and wife team Ken and Angela. The couple are our local experts who also truly see the satisfaction of their customers as their number one priority. As a result, they will carry out a home design visit with you and colour match your décor. Therefore, whatever your style we have the solution for you! With Just shutters the possibilities in your home are endless. Take a look at the countless product styles we stock by clicking here, then browse our photo galleries to get inspired! – Increasing energy efficiency as a result of an additional insulating layer to your home. – Being incredibly low maintenance, hardwearing and easy to clean. – Proving the ability to control your home’s ambiance and levels of light. – Reducing allergens, as a result of the lack of fabric to hold spores. – Reducing noise from the outside and enhancing the privacy of your home. – Being able to resist humidity, making them perfect for your bathroom or kitchen. – Adding value to your home. – Being entirely bespoke to your style. Furthermore, our window shutters also come with our industry leading lifetime guarantee! Call our friendly team of experts today for more information or to arrange your free home visit. Our experts in plantation shutters Cheshire West will show you various samples and work with you to achieve a bespoke package that truly suits your interior. Call 01244 567 890 request a brochure or get an online shutter quote estimate now. Customer satisfaction is at the heart of our ethos. Therefore, we’re proud of the positive feedback we receive. To view more reviews, visit Checkatrade where we have 1700+. As a result we have been awarded an incredible 9.9/10 rating!